Pygopagus twins Margaret and Mary Gibb were born in Holyoke, Massachussetts on May 20, 1912. They were born without a cesarean section, and their mother was one of the first women in the United States to survive a natural birth of conjoined twins (Millie and Christine McKoy's mother bore them vaginally in 1851). They had one younger sister, Dorothy. Their parents refused separation for the twins on two different occasions during their early childhood. Although Mary and Margaret would enter the show business circuit, dancing and playing piano, they never did gain the same notoriety as the glamorous Hilton sisters, with their tales of slavery and forbidden love. The Gibbs were known as sweet-natured Christian girls from a small town, devoted to their family and, above all else, to each other. No sooner had Margaret and Mary come into the world, than their parents, John and Margaret, were approached from all angles by surgeons wanting to try their hand at separating the "Holyoke Siamese Twins". Twice - once when the twins were born and again when they were three years old - the Gibbs fended off the men with the scalpels, preferring to raise their daughters as Nature had made them. The Gibbs raised the girls at home, in relative seclusion, and brought in private tutors to educate them. At the age of 14, the sisters struck out on their own, moving to New York City to pursue a vaudeville career. It was this same year that a severe case of influenza threatened Mary's life, and the possibility of separating them to save Margaret was discussed in earnest. However, the twins overcame their illness, with Margaret all the while speaking words of encouragement to her ailing sister. In 1928, Margaret Gibb was stricken with another "bug": romance. The name of her suitor was never revealed to the papers, but it seemed he would only have her if she were separated from Mary. The twins checked in to New York's West Park Hospital and sought the skills of Dr. Francis P. Weston, a prominent surgeon. Newspapers were quick to glom on to the "danger" aspect of the proposed operation, and speculated that the twins, if they survived, might never walk again, having previously relied on one another for balance. Although Margaret's love affair was the alleged cause of the twins' decision, the sturdier Mary was favored as the survivor, and gossip columns mused about whether or not she would marry Margaret's beau instead. Weston himself gave the twins only a 50% chance of survival, but on August 13, 1928, it was announced that he would separate Mary and Margaret. Things weren't as they seemed, however. Though the twins remained in New York, no progress was made toward separating them, and a few days after his groundbreaking announcement, an indignant Dr. Weston declared that he was postponing the operation until the papers stopped reporting the story! Mary and Margaret, he said, had been "disturbed" by the publicity surrounding the case and their "nervous condition" had made them poor candidates for surgery. Then, the same day, Weston announced that a conference with an "undisclosed surgeon" caused him to change his mind - and that Margaret and Mary would be spared. The Gibbs never were in any danger, of course - I suspect this sensational story was the concoction of their publicists, since the twins were fiercely opposed to separation. Margaret did become engaged, a year later, to Carlos Daniel Josefe, a wealthy young man from Mexico City. Josefe became smitten with Margaret while the twins were appearing in New Orleans. The young couple applied for a marriage license in Newark, but no wedding ever materialized. 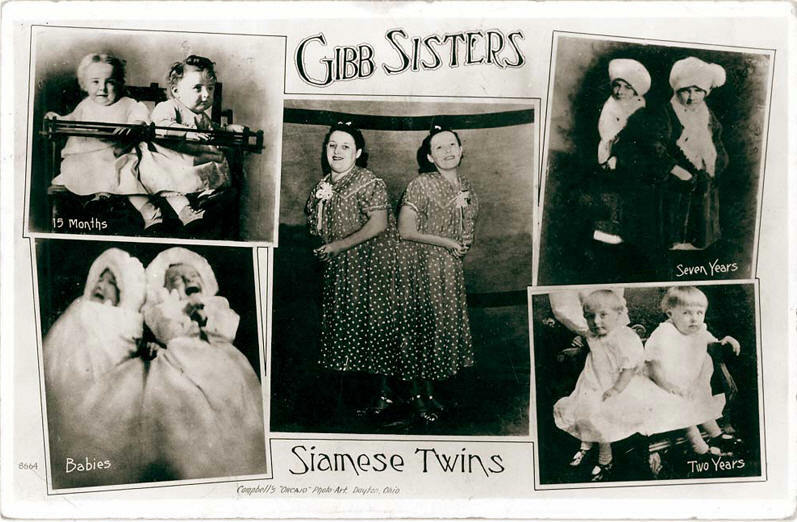 For the remainder of the decade and on into the 1930s, the Gibb twins remained in the public eye as vaudeville and circus stars. They travelled with the Barnum and Cole Brothers Circuses as "America's Siamese Twins", appearing in Paris, Germany and Switzerland as well as all over the United States. In 1942 they returned to Holyoke and opened the Mary-Margaret Gift Shoppe, selling cards, novelties, vases and baby clothes they had made. The shop stayed in business until 1949 when the twins retired from public life altogether. After this they were rarely seen except when travelling to and from church. Their main interests were said to be knitting and watching television. Always the weaker sister, Margaret began to suffer health problems as the twins aged. She underwent two surgical operations, one in 1946 to remove a bladder stone and another in 1953 to remove a fibrous tumor. Their surgeon, Dr. Frank Lahey, said "They are two of the nicest people you ever met in your life." In 1966 it was discovered that Margaret had cancer in her bladder, which, over the next year, spread to her lungs; however, the sisters still adamantly refused separation. On August 29, 1967, Margaret died, and Mary died two minutes later.